A great movie poster can be better than the movie itself. With one single glance, it can sell an impossible promise and offer unlimited possibility. However, in the past few decades, the idea of the illustrated, artistic, idealistic movie poster has more or less gone away. Now, a new documentary called 24 x 36: A Movie About Movie Posters explores why that happened and poses a solution to the problem. Directed by Kevin Burke, 24 x 36 recently had its world premiere at Fantastic Fest 2016. We spoke to Burke about tackling such a massive subject as the birth, death, and resurgence of the movie poster. The original art for John Alvin’s Blade Runner poster. The film begins in the early 20th century at the start of the movie poster. At that time, most of the posters were illustrated, and that sort of set the tone for decades to come. Up through the 1980s, illustrated, artistic movie posters were the norm. Artists like John Alvin, Bob Peak, and Roger Kastel dominated later in the century with their work on posters like E.T. The Extra-Terrestrial, Apocalypse Now, and Jaws. “One of the things I love about this film is we get to introduce people to some names they may not know but whose work they definitely know,” Burke said. Screenprinting is a process where an artist designs a poster and it’s physically created by hand pulling inks in various layers and patterns. It’s usually in a limited edition, which makes things more collectible and this is where Burke’s idea for the whole movie came into play. 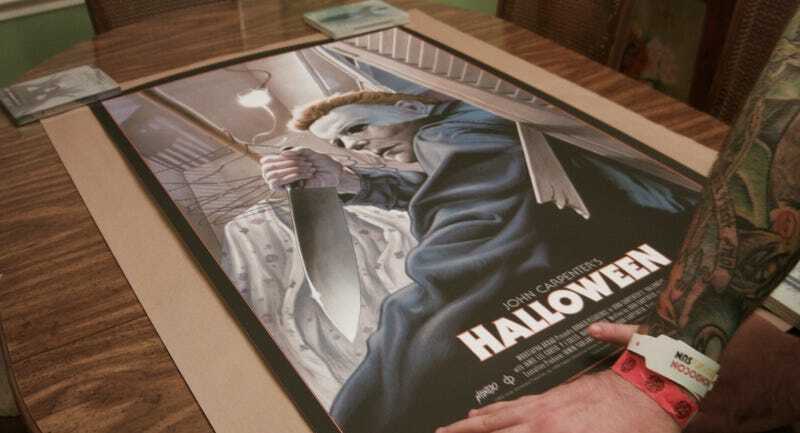 Like myself, Burke is a collector of limited edition screenprints—the kind of stuff you see from Mondo, Gallery 1988, Bottleneck, and Hero Complex Gallery. In his eyes, this kind of work proved there’s still a market for posters that have a bit more thought put into them. And he set out to make a movie about that work. The official poster for 24x36: A Movie About Movie Posters. The documentary is a fantastic guide for beginners to the world: it’s loaded with absolutely gorgeous art from modern artists like Daniel Danger, Laurent Durieux, Jason Edmiston, and numerous others; it talks about art-driven events like MondoCon; and it explores the controversy in the poster world about licensing official images. Unfortunately, it also slows down considerably once it gets to the meat of its argument. However, if it simply teaches people something new about art, Burke feels he’s succeeded. 24 x 36: A Movie About Movie Posters is currently without distribution. It was produced by Snowfort Pictures. Get more information here.